Whenever I read that a Julia Cho play is being performed somewhere, I typically look at the person closest to me and exclaim, "Her...?! Again...?!" Not knowing her work at all and having only met her personally once, I've built a sort of mythology around her because, I mean, I'm not sure that any Asian-American playwright currently gets produced as much as she does. I applaud that, of course, but you know that I just have to roll my eyes in envy simultaneously or I wouldn't be me. I went with Donovan (and Emily) to see the west coast premiere of Durango tonight at East West Players in Los Angeles, so now I feel I can speak about Julia Cho with some authority. And I gotta tell ya: that girl can write! 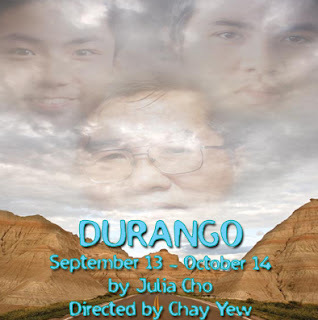 There's a melancholy at the core of Durango, a road trip play about a Korean-American father and his two sons—a broken family slowly unraveling because of its secrets, lies, and self-hatred. The three men have a deep, generally unexpressed love and respect for each other, and that love and respect is the exact thing holding them together while simultaneously driving their destructive need to deceive each other. The comic book-loving son (Ryan Cusino), the guitar-playing slacker (Jin Suh), and their just laid off father (Nelson Mashita) are all imploding. What's really amazing here is the play's and Julia's worldview. In Durango, the three leads go through complete transformation—but that transformation doesn't come about through miraculous change or through tremendous growth. That transformation comes from the simple act of becoming aware of one's self. That's the play's genius—it's not change, not even self-acceptance, but self-awareness, something which isn't typically the end of a character arc. But in the quietness and restraint of the very moving Durango (directed by the incomparable Chay Yew and running through October 14), it's all that's necessary for the characters to move forward.